Never Enough Nails: OPI DS Bold Makes This Pink Wednesday Special! This Pink Wednesday didn't start out so hot for me. If you follow me on Twitter, you might have seen that I was away in the UK last week. So, this morning, I woke up at 5:30 (ugh), as I'm still not adjusted to being back in the US. It was really dark out and also POURING rain. Unfortunately, as the morning went on, it continued to pour rain and it's still dark. 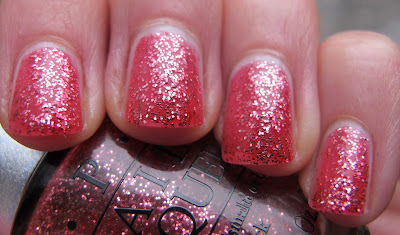 HOWEVER, I received a seriously awesome glitter-y package from OPI!! 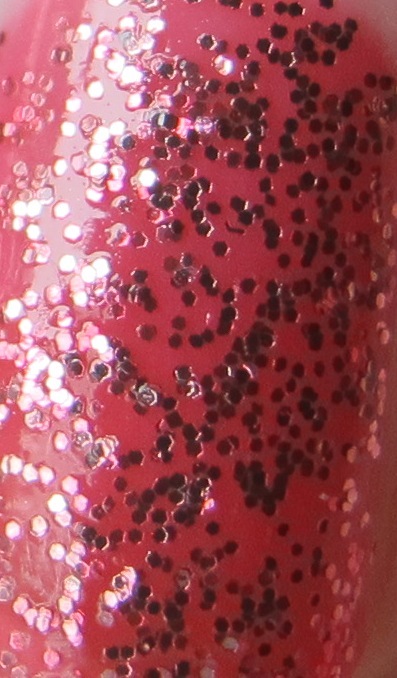 One of the precious polishes in this package was OPI Designer Series Bold. I immediately put DS Bold on all of my nails (none of the usual four nail swatching nonsense for this beauty). OPI Designer Series Bold is a pink jelly base packed with small round pink and silver glitter. OPI's press release called it a rich red, but on me it's definitely pink. This is three coats, and it is nicely full-coverage. 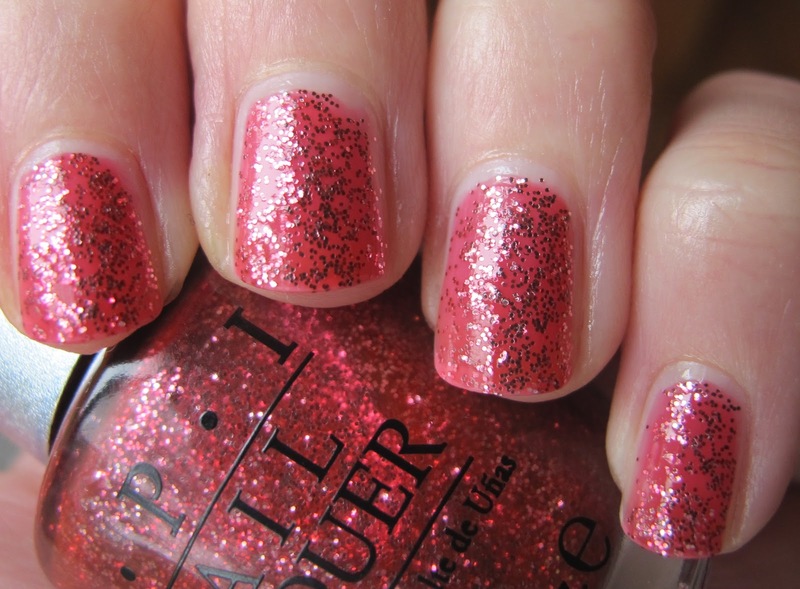 OPI says the formula contains diamond dust, which is probably why this polish is super sparkly!! It doesn't look as sparkly in my pictures as it does in person. I took these quick pictures for you today because I just couldn't keep this to myself! !I will need to re-photograph this when it is not pitch-black and raining outside. The formula on this beauty was lovely. For a glitter, it was quite nice and thin, not super chunky like other glitters I have encountered. The glitter was pretty smooth with just one coat of top coat, but if you are obsessed with smooth nails, you might want to do two coats of top coat. I am REALLY in love with DS Bold, and it's companion DS Temptation (stunning, just wait!). I know some people were disappointed that OPI strayed from the all-holo pattern of the Designer Series line, but I LOVE these. I haven't gone crazy over a DS polish in a long time, but I am flipping over these two!! I will have Temptation up later this week, along with (hopefully) better pictures of Bold. If you see these in store, I would buy them ASAP! OPI Designer Series Bold is available now in professional salons, such as Ulta, Beauty Brands and Trade Secret. I've heard that, but I don't own Mrs. Claus, so I guess that's why it doesn't bother me. I actually haven't been interested in a DS polish in years until these two! you're right, all the last collection was pretty boring too!! besides Extravagance. haha. i just love Original/Signature/Glamour/Sapphire too much. Ahhhh Glamour is the one I really wish I had! That one is incredible! If they were all like that I'd be obsessed with the DS line! But yea the last release was kinda meh.